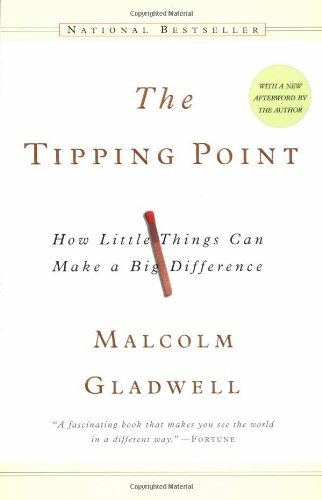 The TBR list that I carry around with me had one book on the top of it for the past couple of years: The Tipping Point by Malcolm Gladwell. I cannot describe the profound satisfaction I felt when I finally got to cross that off this week. I’ve been an admirer of Gladwell’s work for a long time now. I’d read every one of his books, except for The Tipping Point. I think this is one of those cases of not reading a book until you are ready for it. I’m pretty sure I wouldn’t have cared about this book as much if I had read it earlier. I knew putting it on my list for the 2015 TBR Pile Challenge would get it read! The Tipping Point: How Little Things Can Make a Big Difference looks at just that: the little changes that had massive impact. To illustrate his point, Gladwell looks at various epidemics to see if he can pinpoint the little thing that made something blow up. What made Airwalk go from a $16 million company in 1993 to a $44 million company in 1994 and a $150 million company in 1995? How did murder rates drop 64.3% over 5 years in New York City? These are relatively small periods of time that saw massive change- how did that happen? I love Gladwell’s style. He takes these giant concepts and frames them in a way that make sense to the rest of us. All of a sudden the suicide epidemic among young men in Micronesia totally makes sense when it’s framed within the context of the epidemic of teen smoking that was prevalent at the time of writing (The Tipping Point was published in 2000). I always finish Gladwell’s books with a deeper understanding of things that I didn’t know I cared about. For example, in The Tipping Point Gladwell looks a bit at corporate culture. He warns that large corporations are missing out on some crucial benefits of smaller companies when they cross the critical threshold of 150 employees. Apparently the company that makes Gore-Tex (a massive company responsible from manufacturing everything Glide dental floss to filter bags and tubes for the automative, semiconductor and medical industries) adhere very strictly to the rule of 150. As soon as any one of their buildings reaches the 150 mark, they split the teams into groups. They have found that things start to get clumsy and fall apart when you hit that 150 mark, so they build their new plants with only 150 parking spots and the square footage is designed to only accommodate around 150 people. They find that this way they don’t really need a hierarchical structure, everyone knows everyone else and they work together to get things done. All this time I thought working at bigger companies was a good thing but actually, this explains a lot! And that’s what Gladwell is good at doing. He makes sense of the things you didn’t know you wondered about. Oh I guess you’re still wondering about the drop in the murder rate and the success of Airwalk. The murder rate thing came down to dealing with graffiti on the subways and the success of Airwalk came down to pin pointing trends that would become mainstream later on but would appeal to a select group of individuals in the meantime. You should just read the book, it makes more sense when Gladwell is explaining it. Perhaps unsurprisingly given its subject matter, Dataclysm: Who We Are (When We Think No One’s Looking), has been all over the Internet the last few weeks. Christian Rudder is a co-founder of the online dating site, OkCupid and has access to an incredible amount of data. You probably already realized that Rudder is an exceptionally brilliant individual (he did help set up a website based on algorithms after all) but I think you will still be blown away with what this man can do with data. In Dataclysm, he takes this data and manipulates it to tell the truth about people, the truth about us when we’re not busy pretending to be someone we’re not. I’m not going to lie, it’s not a pretty picture all the time. When we think no one is looking we have a tendency to be racist, misogynistic and homophobic. We are also ageist and have a tendency to rate beauty more highly as a favourable characteristic than we should. There was also a graph in the book about how pizza is basically the most popular food ever and that’s something that I totally relate to. I think my favourite discussion in the book was about relationships and your facebook friends. The theory was basically that those relationships where there was the highest overlap in friends were the most successful because those partners were a part of all the different parts of each others’ lives: highschool and university friends, families, co-workers etc. If you want to give it a try (and you should because it’s cool to see) click here. At times this is a really technical book – it is a book based completely on mathematics after all. Rudder even points out that he’s the exact opposite of Malcolm Gladwell who takes a statistic and builds a very personal story around it. Rudder takes all the numbers and looks at what they all tell when they are combined and at times, in an effort to explain the numbers’ sources, it was a little over my head. But then he charmed me back with his extremely readable and relateable prose (he called Dr. Phil a “grinning warlock” on the first page and basically won me over then and there). I think you will like this one if you’re curious about the behind-the-scenes social media scene, if you like to be able to pull out stats and facts at parties or if you’re just looking for some interesting non-fiction to read this season. Remember the other day when I was all “waaaaaa, there are no new books out this fall that I want to read!”? Turns out I just needed to pull my head out of my a$$ and go to a book store. 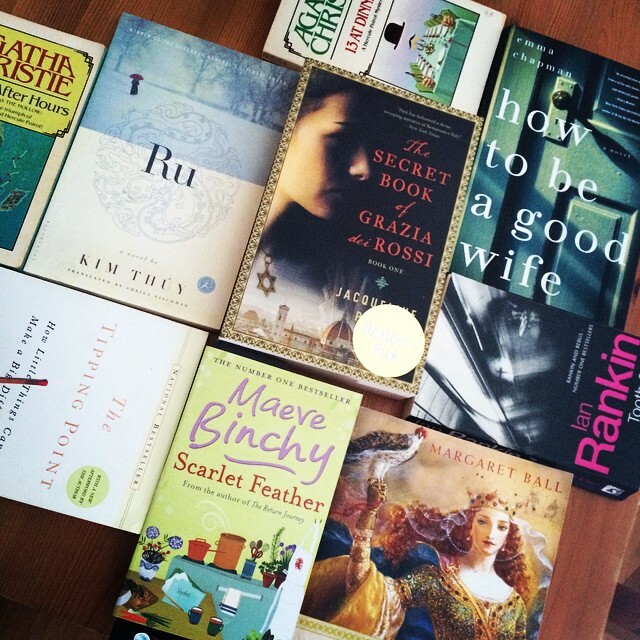 I was in the habit of going to bookstores fairly regularly, opening my wallet and my arms to a number of books. But then I got engaged (woot woot!) and started spending more time at the library in the hopes of saving enough pennies to put towards things like flowers and photographers. The one drawback with going to the library is that the titles on hand aren’t always the freshest. So imagine my surprise (and delight) when I found myself in a bookstore the other night, surrounded by new books that I want to read! And the hits keep coming because this week I’ve been hearing about so many other great sounding books I want. I guess the difference this season is that the books aren’t by authors that I already love. So here’s a rundown of the books that I’m most looking forward to reading soon. Longbourn by Jo Baker. I’m pretty sure this book combines my love of Pride and Prejudice and Downton Abbey and I cannot think of anything more perfect book-wise right now. The story of Elizabeth and Darcy, Jane and Bingley, and Lydia from the perspective of gossipy servants? I’m in. Hitler’s Furies: German Women in the Nazi Killing Fields by Wendy Lower. I have a fascination with Hitler and the Third Reich. I can’t help it – I know it’s twisted. But one thing that’s not often discussed in books about Hitler or the Third Reich is the role of women in the Third Reich. Not the “undesirables” or those women that helped the Nazis to save themselves, but the women that were a part of it all. The ones that actively participated in the solution to the “Jewish Problem.” Wendy Lower finally addresses it and I’m looking forward to reading about them. The Circle by Dave Eggers. Aside from the fact that this book has a beautiful cover, there’s been a lot of buzz about this one – I’ve even heard it described as our generation’s 1984. Which is saying something. The premise of a young woman working for the world’s biggest internet company (think Facebook or twitter) and coming face to face with the reality of that much information and power in one place, really appeals to that part of me that grew into adulthood with social media dogging every footstep. Thunderstruck by Erik Larson. Here’s one of my favourite authors that I didn’t know had a new book out. I loved The Devil in the White City and adored In the Garden of Beasts so I’ve unknowingly been waiting for his new book. Guglielmo Marconi’s telegraph changed the way we communicated but evidently he also played an important role in one of the biggest manhunts in history. Larson is an unparalleled story teller. His tales are true, but you always forget that you’re not reading a novel, such is his talent. The Black Count: Glory, Revolution, Betrayal, and the Real Count of Monte Cristo by Tom Reiss. Last year I found out that Alexandre Dumas was a black man. It had never occurred to me that a famous French author from that time could be black which probably says all the wrong things about me (see why reading is important people? You learn so many things). The Black Count is the story of Dumas’ father who was born in Haiti the son of a black slave, came to Paris and ended up becoming a General commanding armies at the height of the Revolution. How can you not want to read that? And I did actually walk out of the bookstore with Malcolm Gladwell’s David and Goliath because I cannot ever walk away from new Gladwell. I feel like my book spirit has revived! Bring on the long (Canadian) weekend – I have some reading to do! Ever since I left University for the big bad world, I have been struggling to identify what I am passionate about in a professional capacity. I’ve never been able to pinpoint exactly what was so dissatisfying about my professional life. Until I read Malcolm Gladwell’s Outliers: The Story of Success. It’s been on my To Read list for a long time but I never quite got around to actually reading it. I’m a big believer that certain books come around when you are ready for them, and that’s what happened with Outliers. I finished this one last week and still find myself coming back to it every day, thinking things over. Thanks to Gladwell I have finally discovered why I haven’t been able to find any meaning in or passion for my work. It comes down to three things: a lack of autonomy in my role, a lack of any complexity and the lack of any kind of relationship between the effort I put in and the reward that I get from it. Simple right? But at the same time, also totally mind blowing. For me anyway. Don’t worry – I haven’t boiled down the whole book into these three points. Those are the three that really stuck with me but that’s just one chapter. Gladwell also explains why Bill Gates is Bill Gates (it’s not what you think), why Asian students tend to do better in school than their North American counterparts, and what makes a hockey player a success. Gladwell will also help you get a job at Microsoft if you read closely. Obviously, I loved the bit about the hockey players. I guarantee that if you give this one a read, you will find something in there that will change the way you think about things. That’s the power of Malcolm Gladwell. I would love to spend one day in his head and find out how he sees the world. Lucky for us he’s able to explain what he sees, and very eloquently too. Now that I know what I’m missing, maybe it will be that much easier to find what I’m looking for? Here’s hoping. Gladwell gave me a lot to think about anyway.